AHH, THE CRACKLE OF BACON. Butter, hitting the right temperature to snap and foam! Then in go the eggs! The basics of an American Breakfast. As a three-year old, sitting on the floor for hours in a kitchen identical to Julia Child’s The French Chef set, these were the sounds I heard. And revisiting her shows years later, I began to appreciate the nuances of temperature, time, and cooking surface. When my best teflon pan gave up the ghost, I researched All-Clad selections, convinced technology had trumped tradition. Investigations cast doubt, however, upon my preconceptions! The buying decision was even more tempered with caution and eventually placed on hiatus. Along came a fortunate Dumpster® find, as a friend’s childhood abode was being cleared out for the next owner. I had scored a nice stack of 1950’s-era Revere Ware, as detailed here in a previous blog entry. The pile was stored in an apple crate. A piece found use as a water bowl for our cat, some smaller pots went to neighbors, but the skillet? The skillet I retained, beheld by the rich history of its patina and a promise of potential magic. I saw value, but was unsure how to harness its powers. Only after repeated frustrations with our remaining daily-use skillet did I retrieve the old 10″ Revere Ware skillet from the crate, wash it thoroughly, and give it a try. Wow, first use with a grilled cheese, and the butter burned. O.K., it heats up really fast, but it was even. All of the stove’s potential made it to the cook surface. Then I tried eggs, and again burned the butter. Third time’s the charm. I’ve found a perfect pan. Nothing sticks to the decade’s old stainless interior, and the copper bottom spreads heat as well as it did in 1955, when purchased. 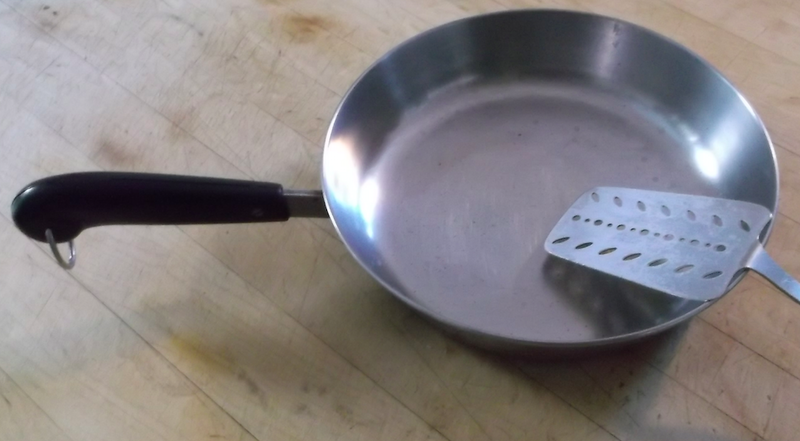 This pan should be a basic tool of anyone learning to cook, as well as a must-have for the experienced chef. About $5 at a garage sale near you, or $25 through online auctions. 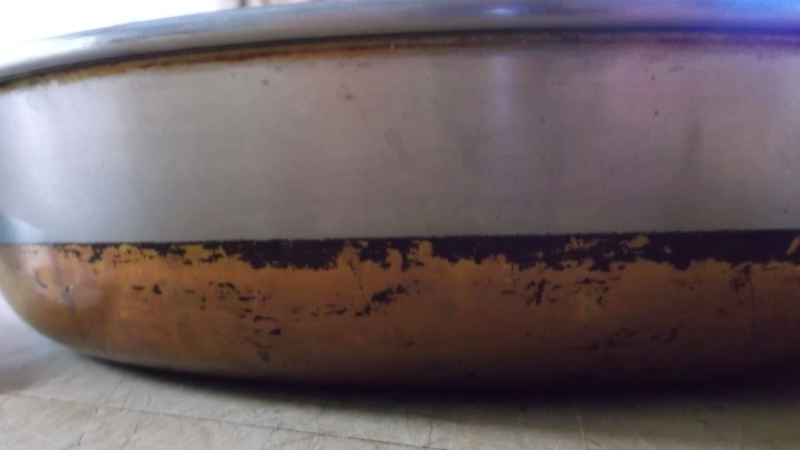 This entry was posted in Food / Cooking, Product Review and tagged American Breakfast, Julia Child, mid-century cookware, paulie and the woodman, raucous brothers, Revere Ware 10" skillet, technology trumps tradition, temperature time surface.